By Jim Ottaviani et al. So, you’ve always wanted to learn how to build an atomic bomb? You’re in luck: Jim Ottaviani is not only a comics writer…he also has a master’s degree in nuclear engineering! But even though it’s not a complete do-it-yourself manual (assembly required, and plutonium is definitely NOT included), Fallout will bring you up to speed on the science and politics of the first nuclear gadgets. About the storytellers: Fallout features art by award winning artists Janine Johnston ( Poison Elves ), Steve Lieber ( Whiteout, Batman ), Vince Locke ( Deadworld, Sandman ), Bernie Mireault ( Mackenzie Queen, The Jam, Grendel Tales ), Jeff Parker ( Interman, Robin ) with Chris Kemple, Eddy Newell, and a painted cover by noted Studio artist Jeffrey Jones. In addition to being the author of the New York Times #1 Bestseller Feynman, all of Jim Ottaviani‘s books have been nominated for multiple awards, including Eisners & ALA Popular Paperback of the Year. They also receive critical praise in publications ranging (widely!) from The New York Review of Books to The Comics Journal to Physics World to Entertainment Weekly to Discover Magazine . “Ottaviani’s nonfiction graphic novel about the two most famous ‘dissident’ creators of the atom bomb meets and in sophistication exceeds the standards set by Art Spiegelman’s Maus (1991-92), Harvey Pekar and Joyce Brabner’s Our Cancer Year (1994), and Rick Geary’s series of nineteenth-century true-crime stories.” – Booklist , Jan 1/Jan 15, 2002; Vol. 98, Iss. 9/10; pg. 801. Download the notes and references if you don’t want to flip back and forth while reading. 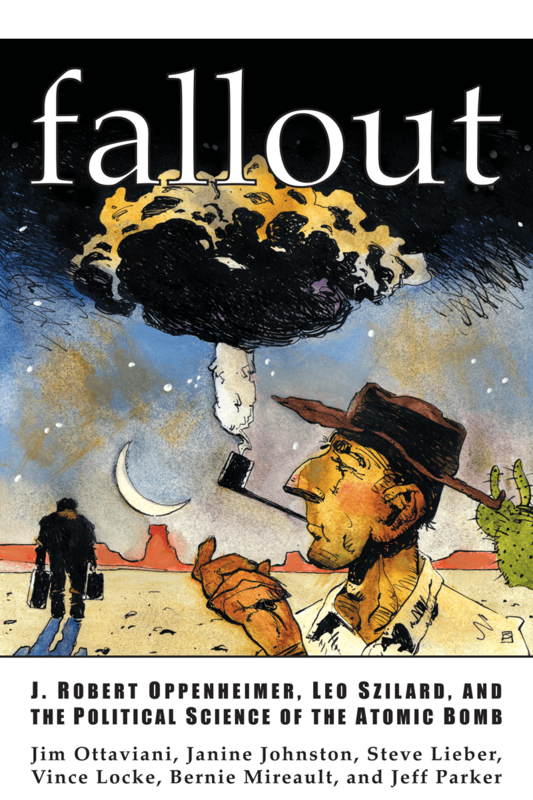 To see prelims and color paintings, head on over to the Fallout extras page. For teachers: We’ve prepared a study guide to assist you in using the book in your classroom. If you have suggestions for improvements or would like to share your ideas, please let us know.